After just three days, it’s safe to say Hong Kong’s new home price stamp duty hasn’t quite worked as government officials would have hoped. The curbing measures, which took effect on Sunday, slapped a levy of 15 percent on residential purchases, but the new tax failed to prevent a pair of properties on the city’s Victoria Peak from fetching a record price per square foot on Tuesday. The pair of units at phase two of Wheelock and Company’s Mount Nicholson fetched HK$104,803 ($13,514) per square foot making them the most expensive apartments in Asia. The total price for the two apartments was HK$912 million ($117 million), and the buyers also acquired a third unit for HK$312 million ($40.2 million). The previous record price for an apartment in the city was HK$103,762 ($13,380) per square foot, for an apartment purchased at 39 Conduit Road in the mid-levels last year. While the government’s new 15 percent stamp tax was set up to put throw a roadblock of about HK$136.8 million ($17.6 million) in front of deals like this, buyers have been quick to find a way around this. Despite the hair-melting price tag for the properties, Wheelock Properties Chairman Stewart Leung Chi-kin said the purchasers happened to be buying their first home meaning they are not obligated to pay the stamp duty. So, what deep-pocketed first time homebuyers are scooping up these luxury accommodations? Sammy Po, chief executive at Midland Realty’s residential department, told the South China Morning Post he believes the units were bought by the children of super-rich families who do not own any apartments. While the government hoped to bring down housing prices when announcing the new stamp duty, which was set at 15 percent for all non-first time residential purchases and 30 percent for foreign buyers, they are unlikely to affect those at the top end of the market. Despite the record sale, home prices in the world’s costliest market are still expected to come down during the next three months. Analysts are predicting home prices in Hong Kong to decline by 5-8 percent. Wheelock hasn’t had a great deal of success at the Mount Nicholson project it jointly developed with Nan Fung Development. Before the most recent sales, the homebuilder sold two similar units at the development in October for HK$749 million ($96.5 million), or an average price of HK$85,000 ($10,961) per square foot. 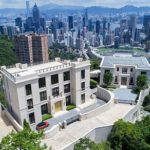 In February, Wheelock sold a luxury home at Mount Nicholson for HK$830 million ($107 million), 25 percent less than what some analysts had estimated. The five-bedroom, 878 square metre home was sold at a time when home prices in Hong Kong were briefly falling.